So I get a call from my daughter, who is going to college in Texas, saying,"Guess what I've got in my car?" 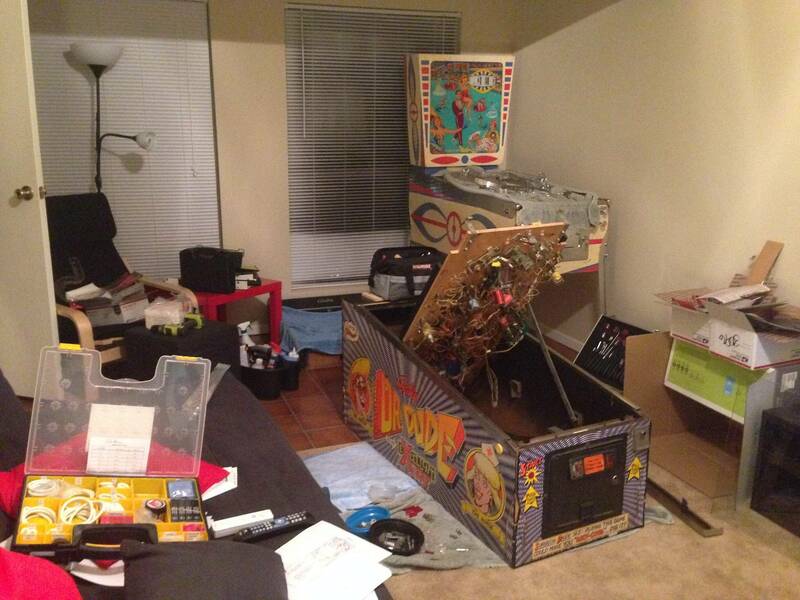 It turns out that it is a Dr Dude that someone had stripped the playfield of most every part and stopped. 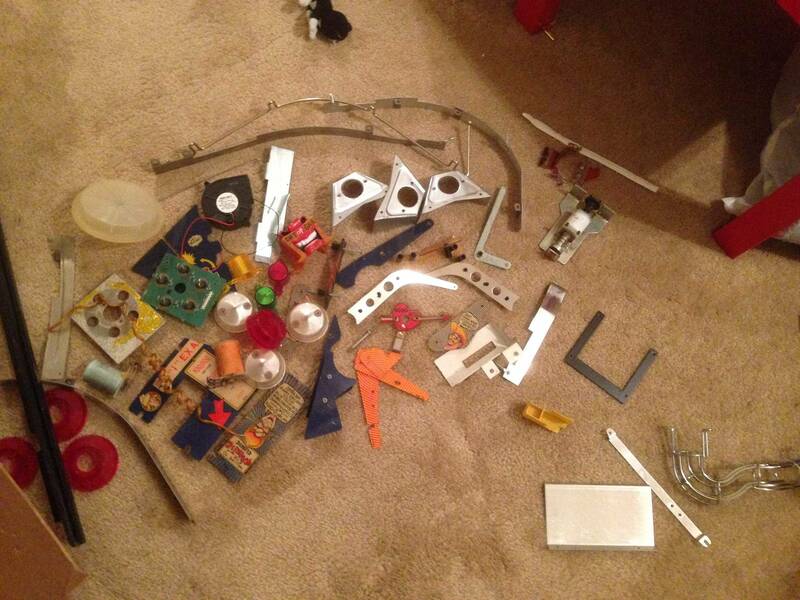 She has parts and mouse doots in boxes and bowls for this machine and possibly others mixed in. The white standup targets are missing along with some posts and hardware and who knows what else. Several of the plastics are broken. Although she has helped me work on machines at home, this is her first experience buying one and working on it away from home. Her enthusiasm is contagious . She polishes parts that are spread around the living room. She calls almost every night to show pictures of her progress. She E-Mails manuals, part catalog and part supplier pages to try and identify missing items. 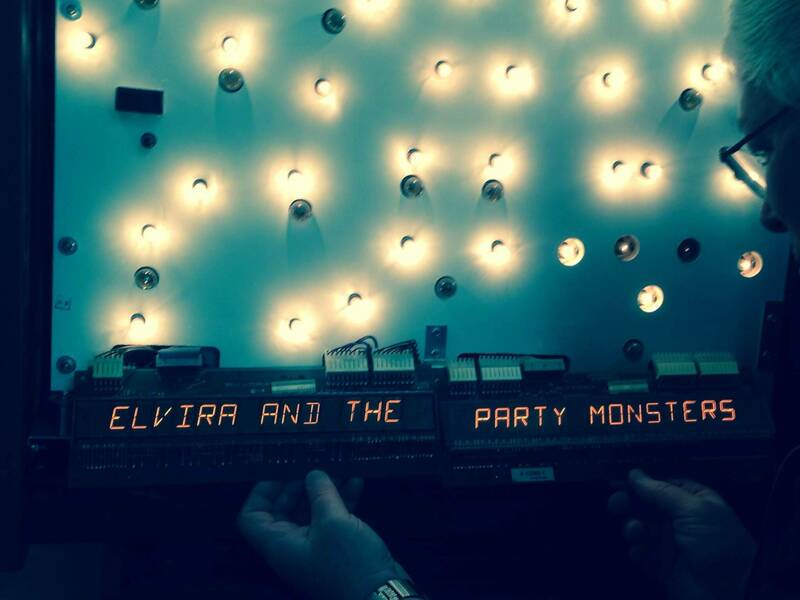 Assuming that the seller is correct in saying that the Dude booted and played and that the displays were good beforehand, who can help her with shop out pics from their own experience? 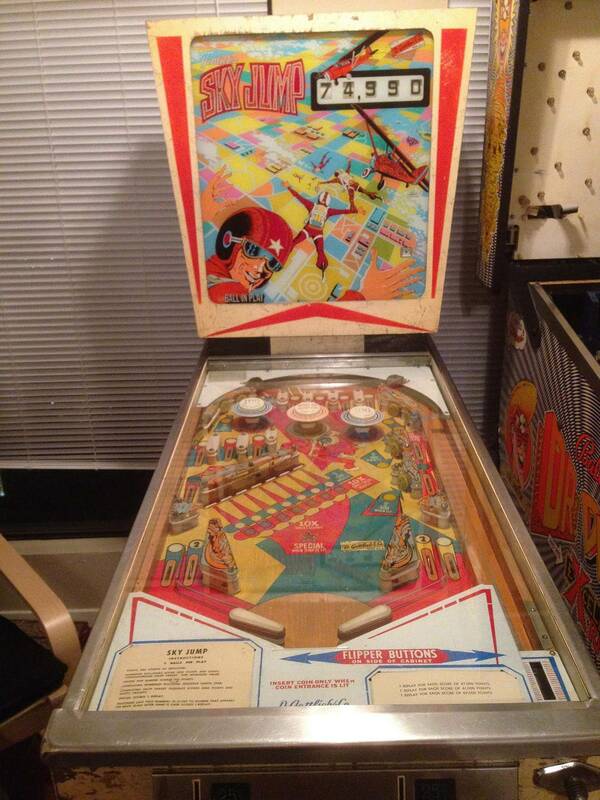 I will be meeting her at the Texas Pinball Festival Saturday evening. We will be shopping for targets, plastics and a translite. We're looking forward to meeting everyone there. I have a pretty good set of pics. 163 of them, about half a GB. Oddly enough I bought a Dude in similar shape, half torn down. Here is a link to the zipped file (file is still uploading, may take a few for link to work). I also documented some of the hacks, not everything is necessarily correct, just how mine was taken apart. Good luck! Thank you so much! Your pics will give her a huge head start! I have a HUO Dr Dude in my collection. It has never been taken apart. If you need any particular pictures PM me and I will take some and get them to her. Thank you for your kind offer. An unmolested example is the best reference that one can have. keriwing08 - It looks like you aren't really playing that Ice Revue, so let me know if you want me to come get it and bring you a table for your dude parts. btw75 I knew I shouldn't have put that in there lol. It's a beautiful game and I am sorry to say it is not for sale! I shall be watching this awesome game. 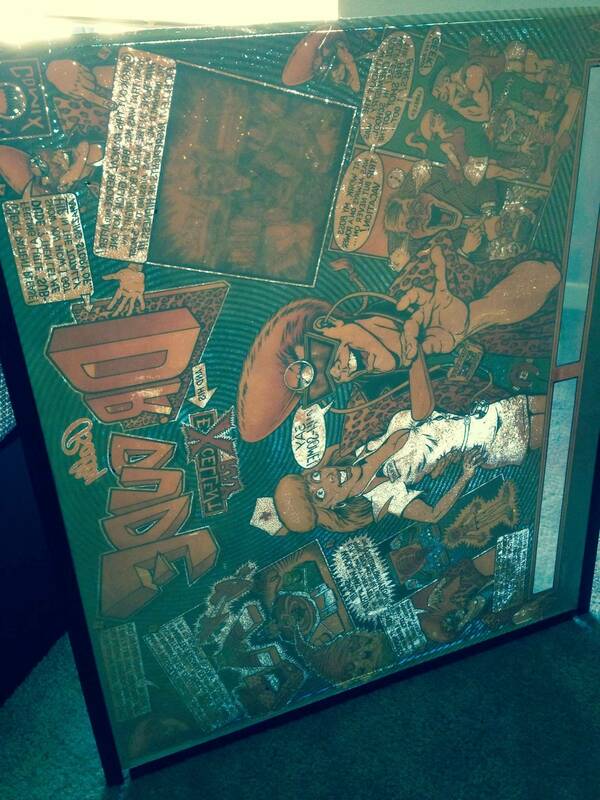 As far as the light for Dr dude head check a flyer there should be pics online. I did a full led of my Dr and I put a color changer in there. All I need to do is the mix master decals. 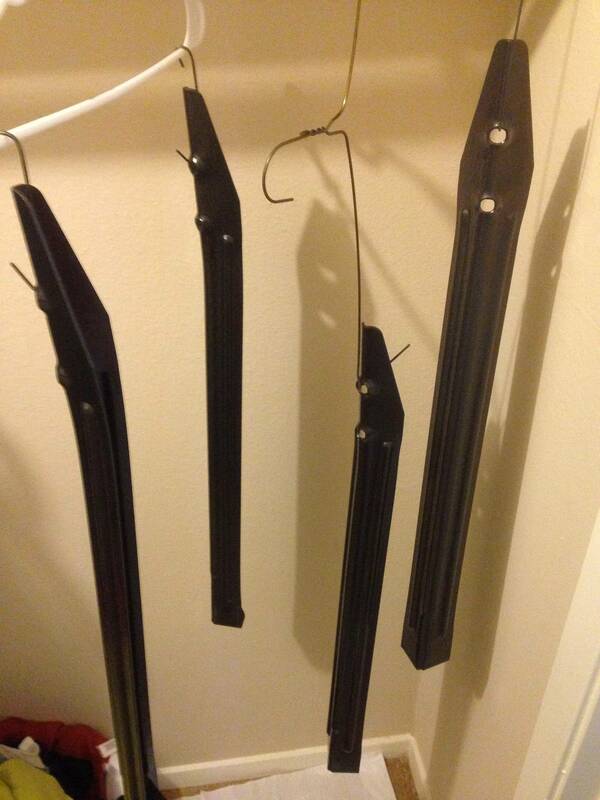 But I was thinking of doing a metal flake paint job. Totally agree (if possible). See if any art buddies at college can airbrush / paint match e.t.c. Then I'm sure you could find someone to clearcoat over it. That would turn out amazing! 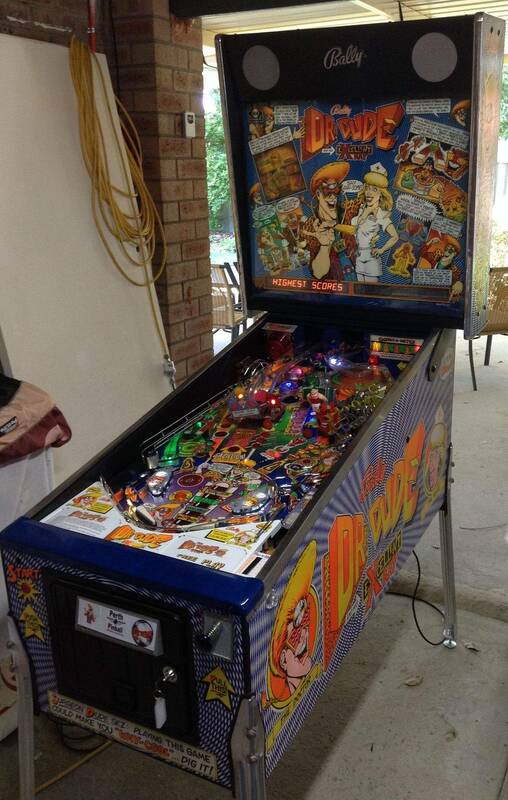 http://pinside.com/pinball/forum/topic/dr-dude-3 if u need a play field reference. You've got your work cut out for you! 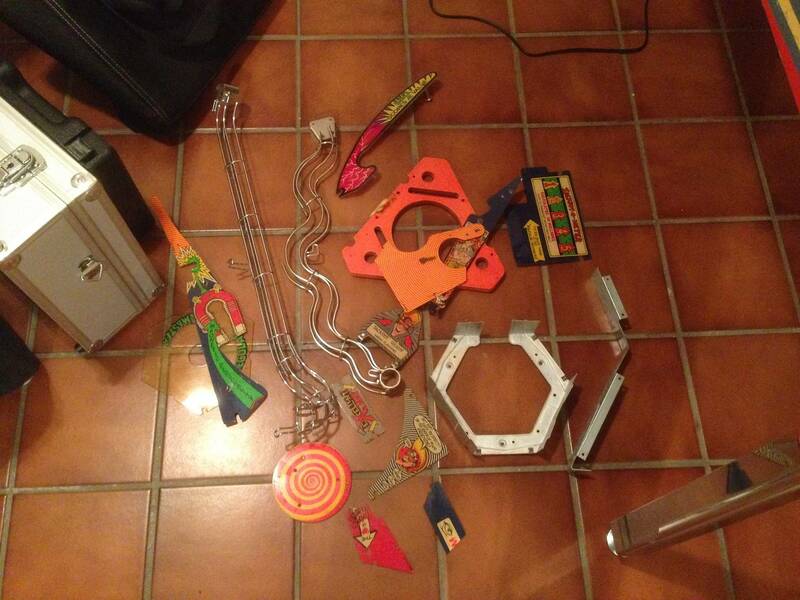 The mixmaster being completely disassembled is particularly brutal. The Ball Scores Value plastic in picture three isn't native to DD. Nor is Santa Claus in picture 2. I hope you've got a Big Shot figure in there somewhere, or maybe the owner has it. My DD had a clear bulb in Dude's head over the ramp, but I believe they were originally yellow? Gift of Gab (yellow bulb rubber), Heart of Rock N Roll (red bulb cover), and on the left the green bulb cover that goes in the playfield is for the Magnetic Personality. 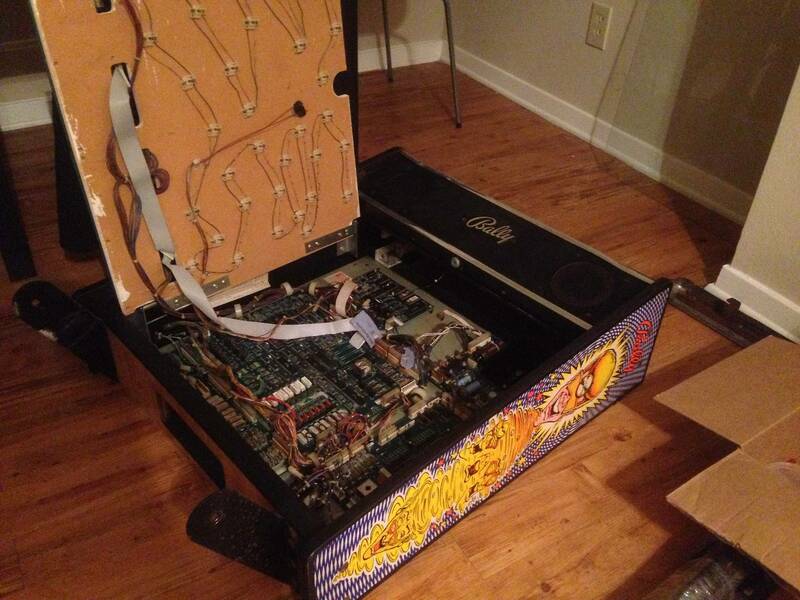 Here's a partial teardown pic. Probably didn't take 100% of the posts off, but most of them anyway. Good luck! I am contemplating touch up and clear coat. It would be very tricky on this game, but it would look good. I do have the big shot figure luckily and the boards and displays look good. I also ordered the mixmaster decals and bought silver spray paint for it and paint for the coin door. 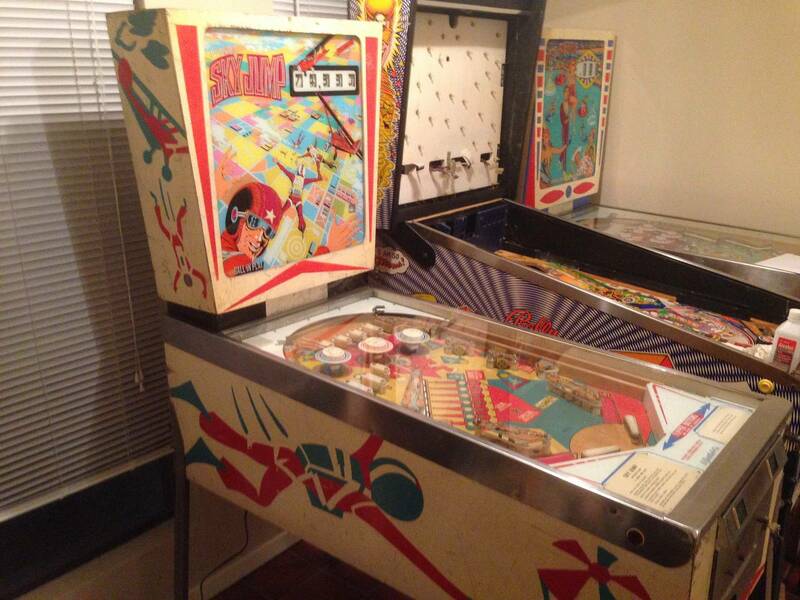 Judging by the stickers that were on the cabinet, this game was on location in Corpus Christi for about 8 years, but it should clean up really nice and I got a good deal on it. Thanks for the help. I will keep you updated! Oh and I have worked on solid states a little bit. I shopped out High Speed last summer, but that was easier since I did the disassembly! Update. Today I had a snow day (in Texas??) 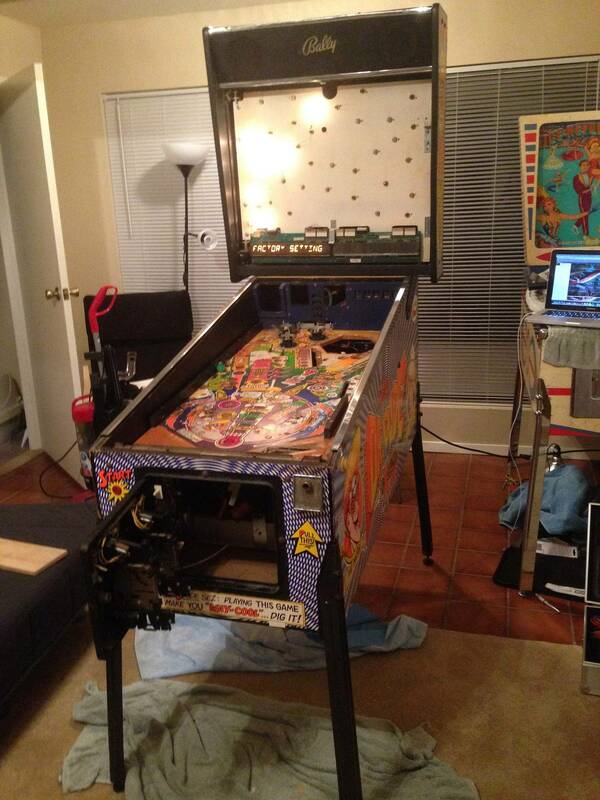 and I received my part order from pinball life, including the new leg bolts, levelers and cab protectors I was waiting for so I cleaned the cabinet some more and set Dr. Dude up on his legs. I hooked up the connectors and got it to a point where I could try turning it on. I got six back box lights and the display says factory settings. Some parts of the letters are out, but this looks like a newer display so it may just be a connector issue. I was just curious to see what it what do. I am going to consult the manual and the interweb to see what the next step is. But now I have a starting point. Here are pictures. I have just about finished mine if I can help at all? Oldskool1969 could you scan your apron cards and send a jpeg to me. My Dude has no cards. Thanks in advance. I also brought his extra ultrasonic cleaner with me which is useful as well as some tools for working on connectors since a couple of mine are questionable. 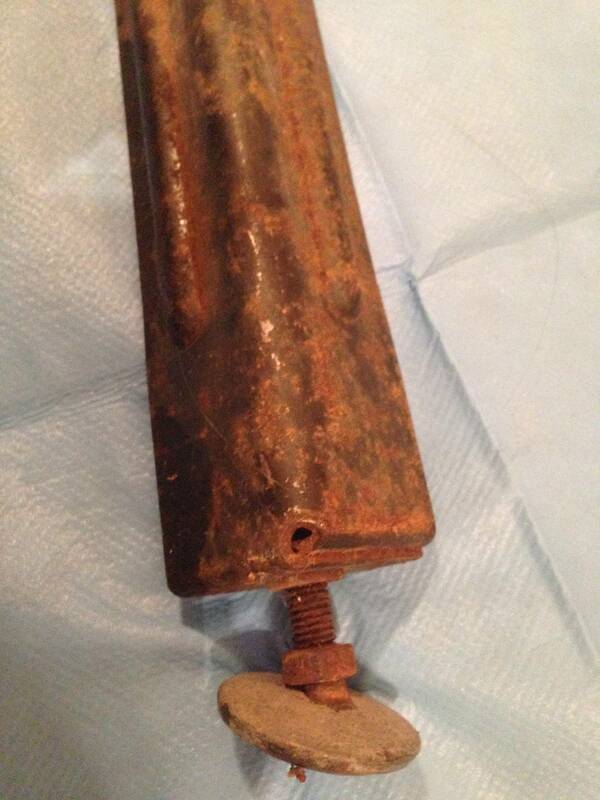 The battery holder had been removed from the board but there is no corrosion. I might buy one of those any pin ram chips at the Texas pinball Festival. Thanks for the offer to help oldskool1969. I might take you up on that if I have a specific question. 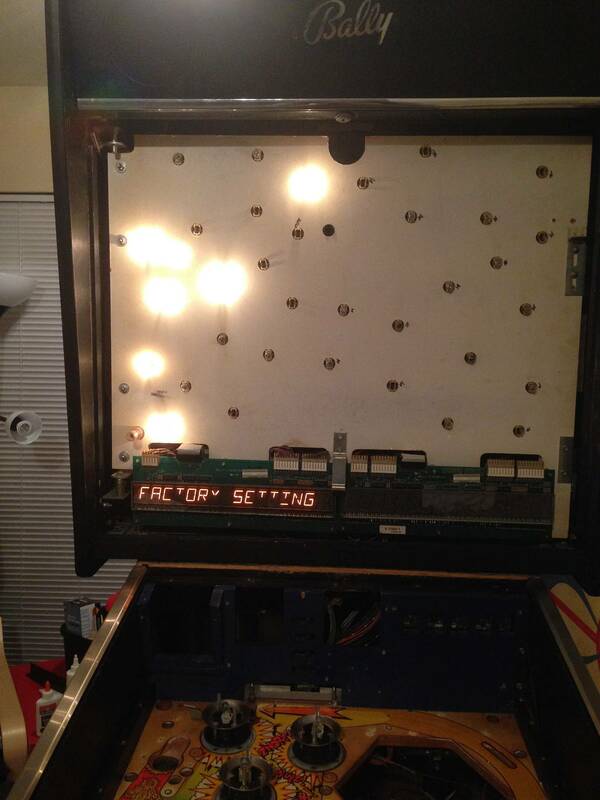 Right now I just keep getting hung up on little things like the coin door paint I bought was too flat, I'm missing washers, e rings, and a shooter sleeve for the shooter assembly, the holes for the plastic trim I bought that goes at the back of the playfield glass don't line up etc. these are all simple fixes but require time, shopping, and part orders etc. so I just need to keep moving. I'm hoping to do more this weekend. Try cleaning the translite before you write it off. Yes it is dirty, but it's plastic. Just don't use anything too abrasive. I can clean it, but I don't know if you can tell in the photo that it is almost like the whites have "flaked" like you would see on a backglass. I haven't seen a translite do this before but it doesn't look so good in the light. 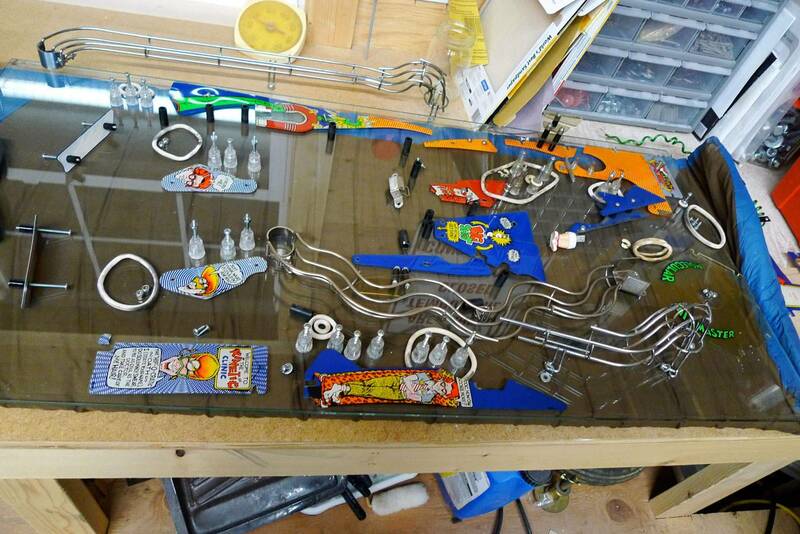 I'm missing washers, e rings, and a shooter sleeve for the shooter assembly, the holes for the plastic trim I bought that goes at the back of the playfield glass don't line up etc. these are all simple fixes but require time, shopping, and part orders etc. so I just need to keep moving. I'm hoping to do more this weekend. In case you were concerned about getting the right e-clips, you can just stop by any auto parts (or likely hardware ) store and buy an assortment package. It comes in handy for sure and is not expensive. Most hardware like screws, washers, and such can also be found at hardware stores - correct hardware in many cases and cheap. So I hear something else lined up in the restore queue recently. I haven't updated this for a while. As far as Dr. Dude goes I have been meticulously cleaning and in some cases painting parts of it and have done a little bit of assembly. The mixmaster is mostly assembled. I picked up a yellow target that was missing at Texas PF as well as some posts and screws that I was missing. I installed the new flippers and put some of the plastics back on. I found the white targets, which were so dirty I barely recognized them but they cleaned up nice. I discovered I might have a board problem that is causing the missing segments on the displays so I may need a new CPU. That's on hold for now as I have been in Kansas for the summer. Now I am currently prepping for a tournament at the house. 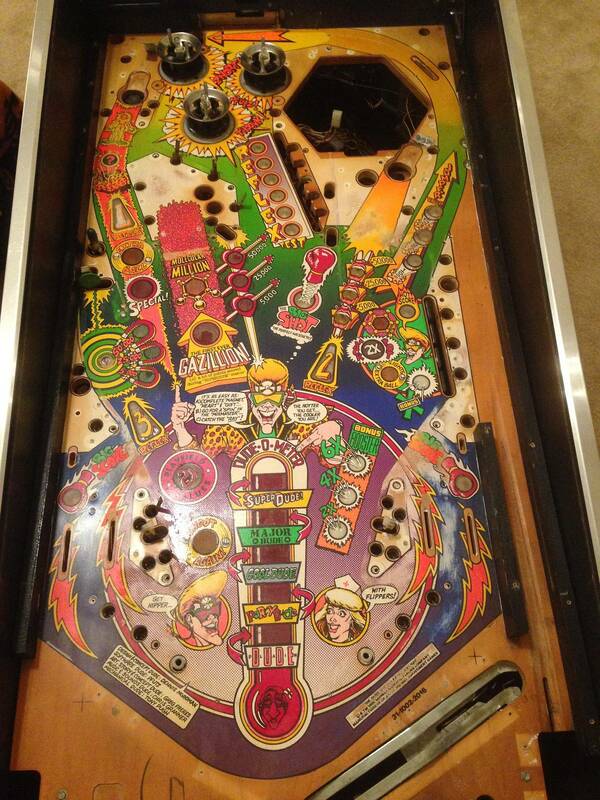 I completely took apart Elvira's playfield and am finally getting to shopping her out, which was long overdue. She plays great but we bought her and a Funhouse from someone who had a house fire so she's pretty smoky inside. Hopefully I will have "after" pictures soon on all of this. I seem to have a lot of "before" pictures in my phone. 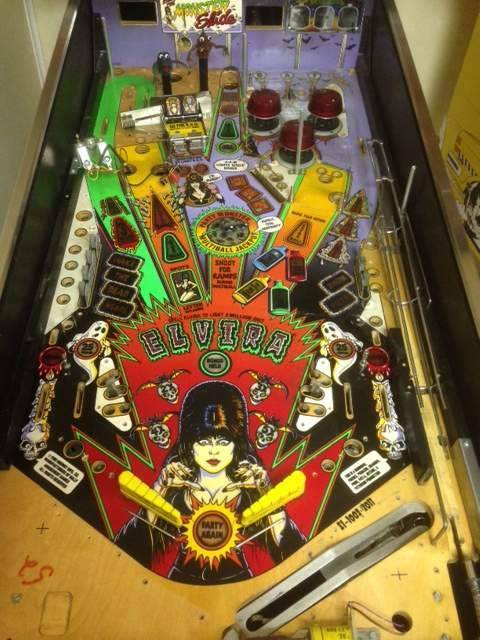 Elvira looks different with an empty playfield.